Ripon, California U.S.A. November 8, 2015 – The new G&Z S400 Compact Slipform Paver delivers the top performance contractors have come to expect from G&Z, while adding even greater value. The S400 entry-level single/dual-lane concrete paver offers the versatility to economically tackle a wide variety of applications, including: city streets, ramps, shoulders, highways, airports, dual-lane, off-set, zero- or minimum-clearance projects and barrier walls. The S400 will be launched to the North and South American markets at World of Concrete 2016 (Booth #C6812) in Las Vegas, NV, USA. The S400 will be displayed performing two different applications – standard slipform paving and pouring barrier wall. This arrangement illustrates how easy it is for the S400 to perform multiple applications on a single jobsite making it an economical solution for any contractor. The S400 barrier wall arrangement utilizes the universal bolting pattern around the tractor. The barrier mold can be attached to the left and right side of the tractor as well as the front and back of the center module. Having four points of attachment offers the contractor flexibility depending on jobsite conditions. The offset/barrier mold attachment bracket is able to accommodate any currently manufactured mold giving contractors the ability to continue to use their inventory of barrier and offset molds. The standard slipform paving configuration will features G&Z’s patented TeleEnd, AccuSteer and SmartLeg features. The G&Z S400 tackles a wide range of paving applications. With its standard telescopic range of 7’ to 16.5’ (2m to 5m), the S400 allows contractors to pave most single-lane applications without the need for bolt-on extensions. With optional extensions, the S400 paves out to 24.5’ (7.5m), giving contactors a combination single and dual-lane slipform paver to increase machine utilization. Designed around a multi-purpose tractor frame boasting a universal bolting pattern, contractors can easily take advantage of this S400’s design feature to easily mount barrier molds, offset kit hangers and attachments, allowing the contractor to pave multiple applications without major machine reconfiguration. The G&Z S400 optimizes a contractor’s fleet while keeping options and maintenance costs to a minimum. 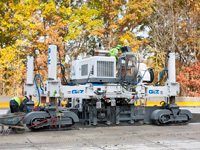 It is compatible with most options and attachments available on larger G&Z slipform paver models, including: paving kit, tie bar inserters, trailing finishing pan, final finisher, etc. “Designing the S400 to use many of the same components as our larger pavers allows contractors to expand their fleet with minimal capital expenditure outlay,” adds Meskis. The paver’s Tier 4i engine offers low fuel consumption, does not require a particulate filter like other Tier 4 engines and offers extended service intervals. Its “Eco-Mode” feature reduces fuel consumption by up to 35%, significantly lowering long-term operating costs. Its economical plow spreader dramatically reduces maintenance costs versus an auger spreader design. 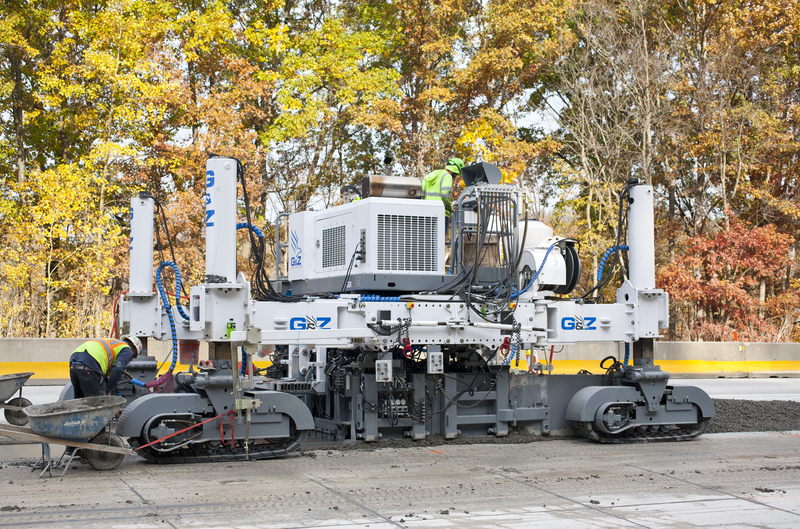 G&Z is dedicated to designing machines that Maximize Available Paving Time and Minimize Everything Else. True to this philosophy, the new S400 adopts industry proven and requested options only available through G&Z. AccuSteer and SmartLeg work together to move the track and swing leg on the fly as well as semi-automatically reconfigure the S400 into 90-degree, counter-rotate and transport modes, dramatically saving time. VariWidth and TeleEnd reduce paving kit and tractor width change time from days to a quick 2 hours, in most cases. These unique options increase the S400’s paving productivity, which gives contractors more paving days in a season, maximizes productivity and minimizes downtime. The G&Z S400 features a patented double telescopic tractor frame, access walkway, and hose hinges for a nominal working range of 7'-0" to 16'-6" (2 m to 5 m) with up to 4’-9” (1.5 m) of telescopic ability per side. With the addition of optional bolt-in tractor frame extensions, the S400 tractor can extend up to nom. 24'-6" (7.5 m). In transport mode, the S400 is 10’-8” (3.25 m) high x 9’-10” (3 m) wide x 21’-8” (6.6 m) + paving width length. At 16’-0” (5 m), the S400 is 48,000 lbs (21,719 kg) without options. When the tractor frame is equipped with G&Z’s Patented VariWidth System, major tractor width changes can be done in minutes. The S400 is available with G&Z’s patented and time saving TeleEnd: Telescopic Paving Kit End Sections which allow hydraulic telescopic ability of 3’ (915mm) per end. The S400 can be equipped with a mechanical dowel bar inserter (DBI) and can be supplied with hydraulic or electric poker vibrators. The paving kit, front tie bar inserter and many of the other optional attachments on the S400 are interchangeable with other G&Z paver models, giving the contractor a more versatile fleet of paving equipment.